Before going any further, let me bust a myth that still might be having some traction: Late summer and fall allergies are not caused by goldenrod (Solidago spp.). 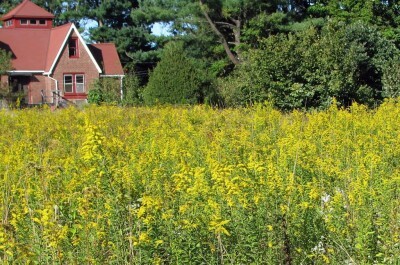 Goldenrod gets the blame for its showy, yellow blossoms during this allergy season. But the true culprit is ragweed, which goes unnoticed because it bears only small, green flowers. It makes sense that the pollen of a showy flower would not cause allergies. Showy flowers put on their show to attract insect (and, in some cases, bird or bat) pollinators. Wind can’t carry their heavy, sometimes sticky, pollen. Pollen that causes allergies wafts around in the wind. Wind-pollinated flowers (euphoniously called “anemophilous” flowers) don’t need to attract animal pollinators.